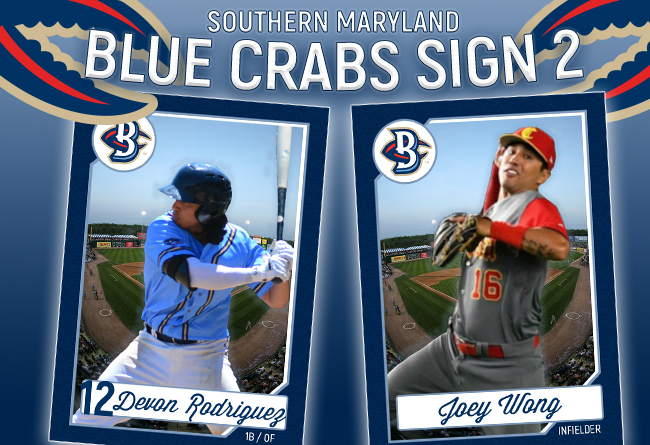 (Waldorf, Md., Feb. 7, 2018) - The Southern Maryland Blue Crabs have announced the return of two players, Devon Rodriguez and Joey Wong, for the 2018 season. Rodriguez returns to the Blue Crabs after an All-Star campaign during the 2017 season. The utility man joined the team in May, jumping into an everyday starting position in left field. The lefty came in on fire at the plate, hitting over .400 in his first two months with the team. This first-half performance led to his selection to represent the Freedom Division in the 2017 Atlantic League All-Star Game. Rodriguez played a major role in the First-Half Freedom Division Championship Game, going 3-5 with two RBI’s and two runs scored, helping the Blue Crabs punch their ticket to the postseason with an 8-3 victory. Wong will return to Southern Maryland after a brief time with the team last season. The infielder was signed by the Blue Crabs in late February, but was picked up by the Seattle Mariners organization before he could make an appearance for the team. Wong made his professional baseball debut in 2009 out of Oregon State University, being drafted in the 24th round of the MLB Draft by the Colorado Rockies. The 29-year-old spent his first eight seasons in the Rockies organization, before joining the Mariners in 2017. Wong was also selected to represent China in the 2017 World Baseball Classic, starting all three games for them in the tournament.